That I’m aware of, the concept of a mastermind alliance was created by Napoleon Hill. I first heard the word in his book “Think And Grow Rich” almost two decades ago. But when we work together we come up with something totally different and most of the time MUCH better than either of our own ideas were individually. I’ve been part of several groups over the years. Some good, some not so great and some AMAZING! 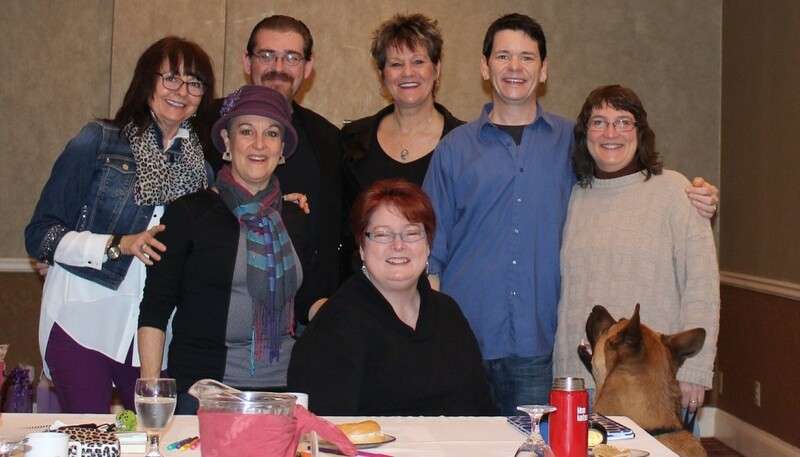 Just this last week I spent 3 days in downtown Portland with Kathleen Gage for her “Speak, Sell, Profit” Mastermind Event and it reminded me why I love mastermind groups so much when you get an amazing group of people together. Mastermind groups aren’t about someone just teaching like a seminar or conference. They are about everyone contributing and this was just that. We all had such a great time helping each other with business ideas, tools we recommend, ideas on new ideas and even the simple (yet VERY needed) support to help each other see our true value. We can’t figure it out all on our own. Well… you could but why take years to learn something that someone else already figured out the hard way and wants to share with you? When you’re in the right mastermind group, you’re very likely to be able to ask a question and have at least 2 other people give you their results after they had the same thing happen to them. Of course, with advice and shortcuts along the way. I can’t count the number of times I’ve been in mastermind groups where someone was talking and I was able to tell them something I did that would work for them as well. When you think from a collaborative mindset you are much more open to sharing those things and everyone loves it. Of course, you can get the same way as well. I’ve been in several meetings where something someone else did sparked an idea for me and I jumped on it while incorporating their base ideas with my own flair. That’s part of the process. Obviously if someone comes up with a great new product idea you shouldn’t steal that idea. That’s not cool at all, but if you can take an idea they had and work something similar into your own strategies, that’s ok and should be expected. It’s said that we all know about 250 people personally. In today’s world, and especially entrepreneurs, I’d say it’s MUCH higher than that. Chances are, you know someone that your mastermind partners should know. In last week’s retreat I met a guy, John, that has cooking classes around gluten free. The first thing I thought of was someone that I know down the road from me that owns a gluten free restaurant and catering company. They are a perfect fit and I was crawling out of my chair because I wanted to connect the two of them. Part of the purpose of a mastermind is to share resources as well as knowledge and ideas. I managed to be able to share a few connections of people I know as well as suggestions for hosting companies (and why), plugins for WordPress I recommend along with a few tips on my own specialty of productivity. It’s all about helping any way you can. The goal of any mastermind group isn’t to farm the group for leads. I want to make that clear up front. It’s about connecting and adding value to everyone in the room. As long as that’s clear up front and everyone contributes to the the best of their abilities everyone will be happy. It’s not uncommon for a web designer to be part of a mastermind group and soon after most, if not all, of the members end up working with that designer. It comes with the territory of connection and trust. Remember it’s not about pitching your services to the group. That doesn’t mean you can’t find clients though. For many of us, we work from home. We have virtual staff. We aren’t in your typical office environment and for many it can be days where they don’t see a single actual live person. Even if it’s virtual and you use Google Hangouts or Skype, that connection with real people that “get it” is critical. It helps keep you going when things get hard. We need support from others, especially as an entrepreneur. Many times, family and close friends just don’t get it. The ability to hang out with someone that’s like minded and gets what you are going through can be the single driving thing that keeps you sane. I remember a group I had in Phoenix. It was the highlight of my week for many weeks. I was so excited to share wins. I knew I could count on them to help with things that got me stuck, and I was energized by being part of the group to help brainstorm for others and help them in their own troubles. It’s a feeling like no other. Your mastermind alliance are the people that will pick you up when you fall. They are the people that will applaud your successes. They are the people that will openly give you their knowledge and experience. They will be tough when you need a kick in the rear. They will give you a hug when you break down. That’s what a mastermind is all about.